They also rank the hosts with a “BearScore” that represents the performance and specs vs. the monetary cost. Of course, there’s more to choosing a host than just raw performance. Reliability, knowledgeable staff, and quality support when something goes wrong are also very important. Unfortunately, those things are harder to quantify statistically. 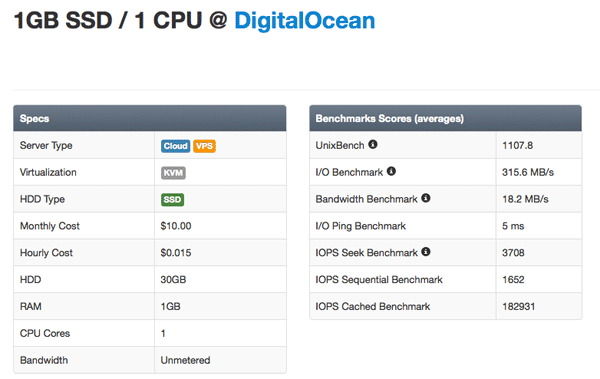 Looking at the statistics, this up-and-coming DigitalOcean seems pretty good. Their $10/month offering seems to outperform my two-node VM from VPS.net (which is currently priced at $38/month for new customers…) in most areas, except for network speed. DigitalOcean, according to other sources as well, seems to have slower internet connectivity than Linode and VPS.net. But at a fraction of the price, it’s a very attractive option. Thanks for the mention Matt! You’re doing good work over there. ServerBear was invaluable in a recent decision, and it makes running benchmarks dead simple.